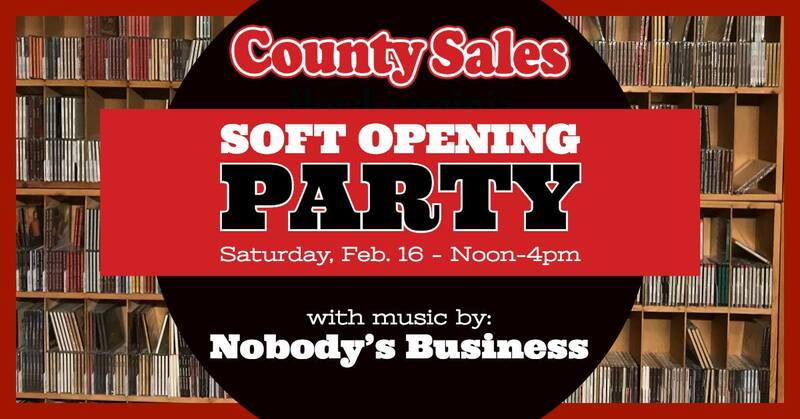 County Sales presents a Soft Opening Party with music by Nobody's Business on Saturday, February 16, 2019. County Sales is moved in to the new location and you're invited to help us celebrate! Our Grand Opening party will be in April, but we wanted to share this accomplishment with our local community with a party. Please join us from Noon until 4:00 pm for light refreshments and music by Jackson Cunningham and Nobody's Business. We look forward to celebrating with you! Nobody’s Business is a band from Southwest Virginia and Northwest North Carolina that plays traditional first generation bluegrass, old time string band and classic era country. Country Sales is the world's largest selection of old time and bluegrass music recordings, videos and books. Country Sales new store is located at 117 South Locust Street in Floyd, VA.
To view the event flyer, visit: https://i.imgur.com/sYzdMHP.jpg. For more information, visit: http://www.countysales.com/ or https://www.facebook.com/countysales or call 540-745-2001.